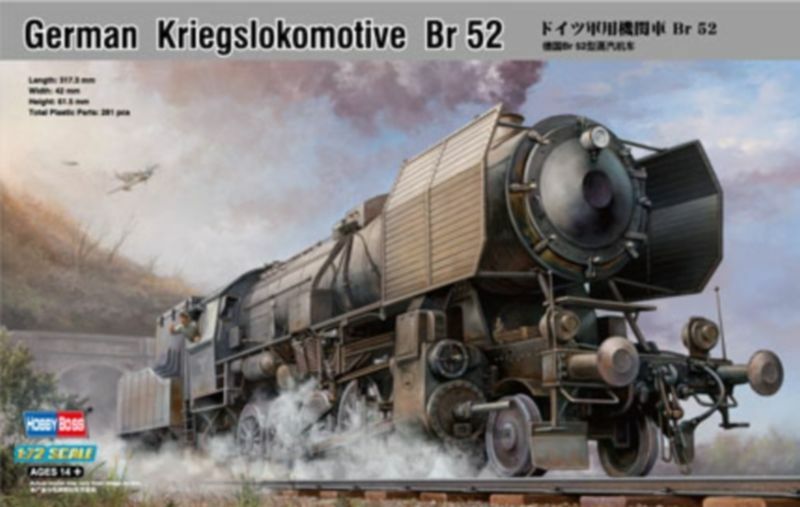 The next German steam engine is the BR 52, again from Trumpeter, a sizable monster 2-10-0 with tender that will take up a lot of real estate on your diorama at over 2 feet long. YUP!!! Here we go with ANOTHER REPEAT!!! These BOZOS have NO IMAGINATION!!! Most of the current railroad kits are totally devoid of underbody detail except for an air tank or two. Those of you who know me know that just won't do "for da Chassis Man." Anyone know of a source for Westinghouse Airbrake castings in 1/35th or 1/32nd? Don't want to have to scratch build something but hey, if ya gotta, ya gotta! Thanks to Freachy I now know that P.Z. models now makes European brake rigging in 1/35th scale. This is a great idea that I hope gains traction with model companies. 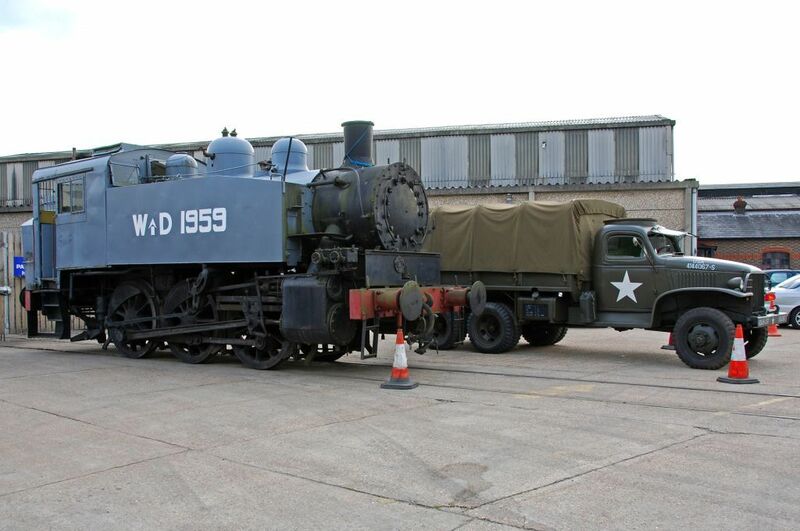 I'd love to see an ALCo RS-1 in 1/35. 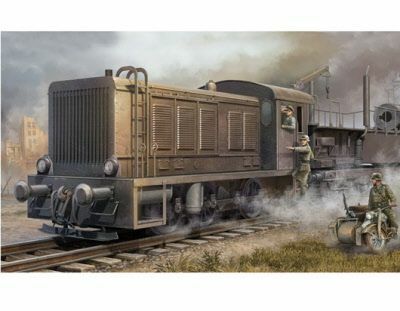 Just a thought, why not lobby for locos in 1/48? American prototypes are readily available in 1/48 - O scale. Well as a little pun Mirror Models in now offering a European Trolley Car in 1/35 scale plastic so you could say we HAVE gained Traction. Traction being a US expression for anything running on overhead electric power. ( If it does not generate its own power internally - it's Traction.). The small USATC shunter/switchers were found across Europe, Africa and beyond including China IIRC. The Hunslet "Austerity" shunters, prolific in the UK and found post-war in Europe and Africa. 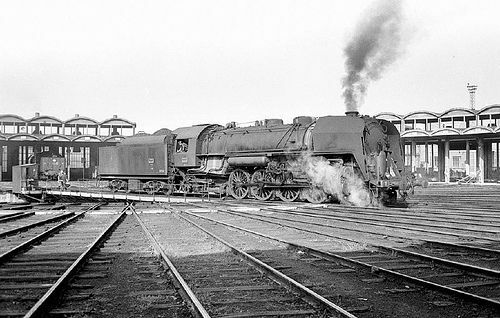 LMS "8Fs", Riddle's Austerities - 2-8-0 and 2-10-0 heavy freight locomotives built en masse for the War Department and used in Europe and Africa. Austerities found themselves from Hong Kong to Greece and many places in between. Another beauty shot - this time of what I THINK is a Br 50. I believe the only difference is the larger capacity tender. (Personally I like this one better. The half round one on the Trumpeter kit looks sort of stupid. 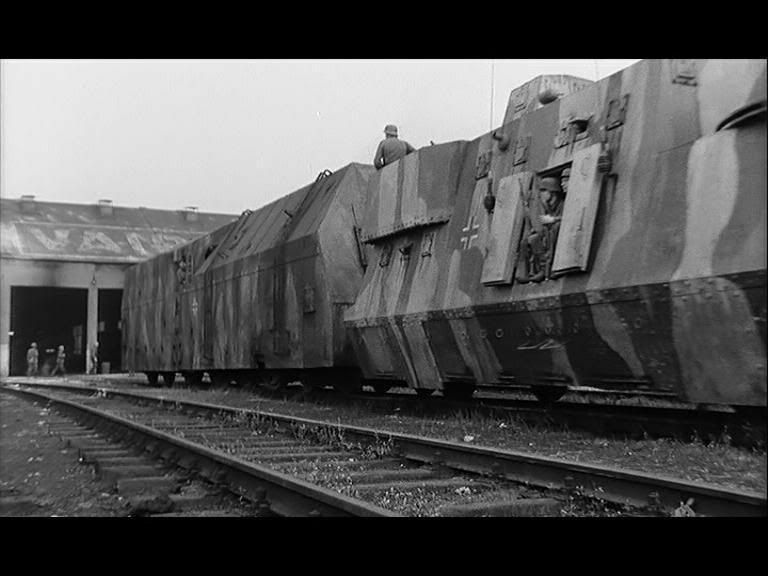 And now for the GERMAN armored locomotive - not unlike the one that appears early on in "the Train". When I found the photo below I thought I had hit paydirt but, hey, wait a minute, that's a Hollywood publicity still from the movie "the Train"! Is this what trumpeter is using for reference now, a shot from a 1960's movie? What the heck, I can forgive them. It was a very realistic, well done movie and the Triebwagon or whatever it is called in front of the locomotive was right on the money!!!!!! p.s. That clock on the corner of the engine house building on the box cover art is again, right out of the movie "the Train". If you're into German armored trains, you probably know about the French 1946 movie called "La Bataille du Rail" (The Battle of the Rails). 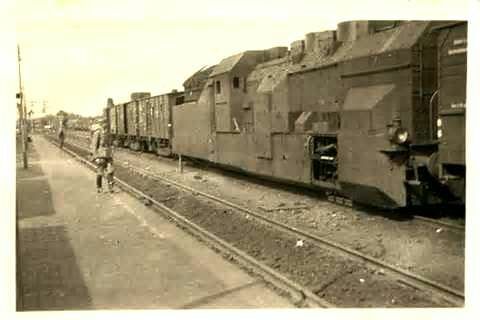 They've used a real German armored train except for the locomotive which was fitted with fake armor as the original one had been put back in civilian service . 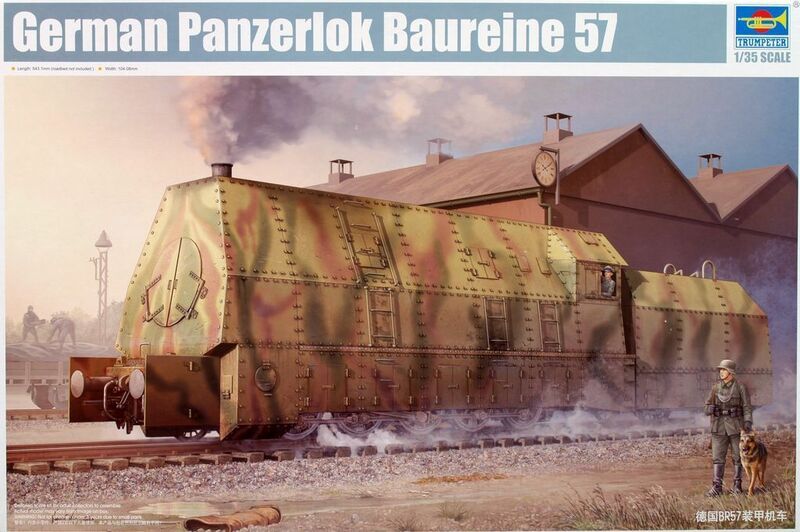 This train was the Panzerzug n°32 captured intact in September 1944 by a French TD unit. 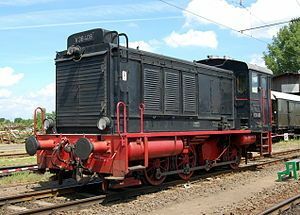 Then we have the German C-12 Diesel Hydraulic* Locomotive also from Trumpeter. (Have you noticed a pattern here?) The 1/35th scale RR equipment is released by Trumpter and the smae subjects at release by HobbyBoss in 1/72nd scale? Kinda odd? * Diesel Hydraulic = Engine turns an oil pump, the pump feeds oil under high preasure to an oil motor thru hoses, which then turns the wheels. Fewer moving parts, no mechanical connection to the driving axles. Diesel Electric = Engine turns a Generator which is wired to electric motors thru mounted on the drive axles. Most simple of designs. Diesel Mechanical = Most like a truck or car. Engine feeds power to wheels through a clutch, transmission, drive shaft and gear box(es) mounted on the drive axiles. 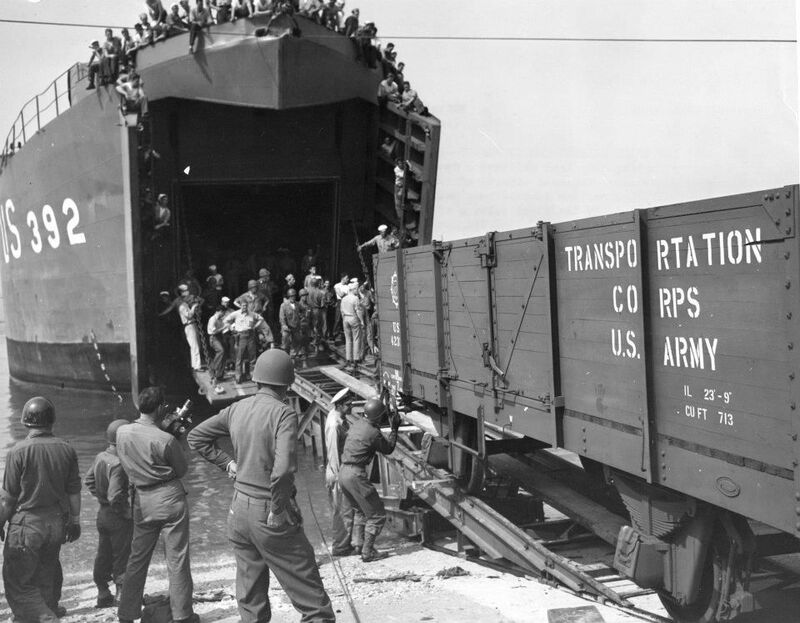 We talked of this earlier as to what might be the biggest locomotive imported from the US to Europe during or just after the war. 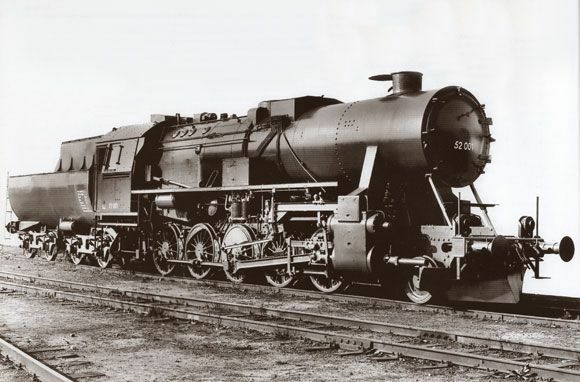 Here is a possible canidate: A high drivered 2-8-2 Mikado. I think it comes from Baldwin Locomotive Works but it is BIG for a Mikado! I'm smelling a Locomotive Campaign very soon. Also they are proposing another campaign to be called "Railroad Campaign"
The "Steel Wheels" campaign is kinda funky in that it refers to both Panzers with steel wheels AND anything Railroad related??? I can't say I understand it but whaaaaat-ever! Yeah, I know about them and I agree with you. They both should be separate. But let's hold out for awhile on the Railroad Campaign next year as I believe the current one has been cancelled and the leader lost interest. Hi, All! 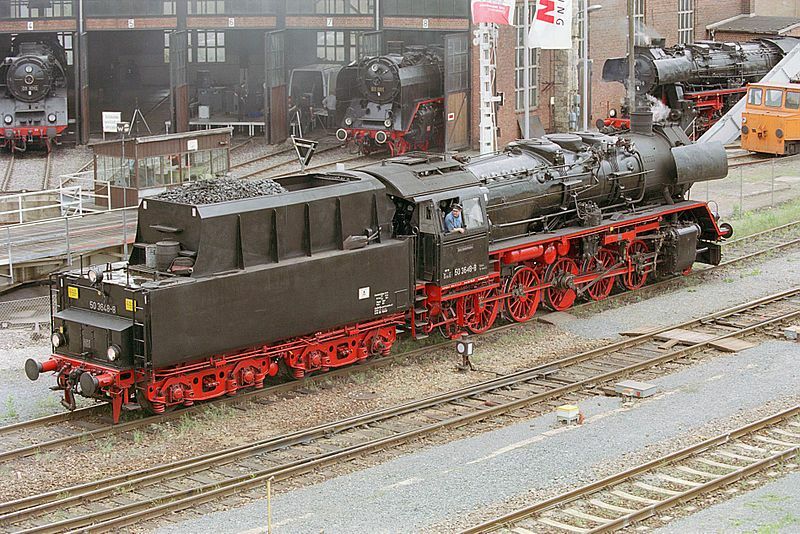 I have my doubts about this being a US-built 2-8-2, especially by Baldwin. 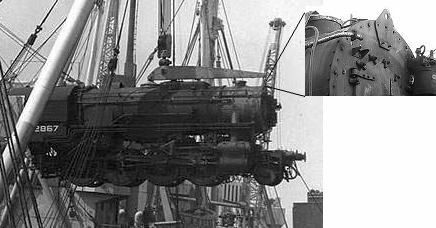 One of Baldwin's very recognizable traits are taller cab heights and taller steam and sand domes. This one looks a bit more like an ALCO (American Locomotive, Schenectady, NY) product, what with the cab-height being in line with the top of the boiler. 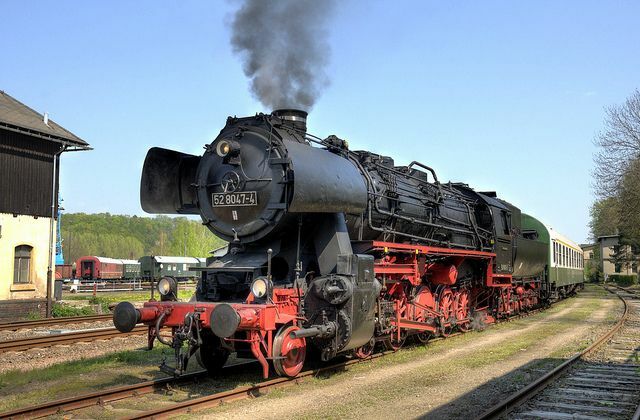 It could pass as a US-built locomotive, as it DOES have some very American-looking traits, aside of the VERY EUROPEAN-style smoke deflectors. But I don't think that this is an ALCO product, either. At this time, ALCO was very busy building the New York Central L3 and L4-series 4-8-2 Mohawks, developing the S-series 4-8-4 Niagaras, and building the various 4-6-6-4 Challengers and 4-8-8-4 Big Boys. Back in 1941/42 ALCO was busy with late M3 and early M4 Mediums... So, what IS this thing? Hi, All! Didn't TRUMPETER already do a BR-52? That particular wording was only intended to mean the next already existing model I would be talking about, but you are the second person to miss-interrupt what I was saying. I wish I could go back and edit those earlier posts, I thought if you created the thread in the first place that you could but it appears not. Re: The USATC S-160 Locomotive - Just in case you were wondering what that odd looking tab on the top front of the smobebox was for . . . The lifting spanner is $14,000 extra (in current USDs) but if you buy 3 or more locomotives its FREE. The spanner fixture certainly balances the engine perfectly! Darn Seebees will build a railroad ANYWHERE! This photo came off the Seebee Museum website - lots more interesting photos - check it out!